"Yosemite National Park, one of the first wilderness parks in the United States, is best known for its waterfalls" (www.nps.gov/yose/). It is also listed as one of the UNESCO World Heritage Sites. 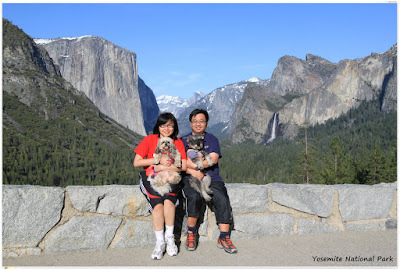 Since it takes approximately a 4 hour drive from our home, we decided to travel to Yosemite National Park over the weekend with our dogs. 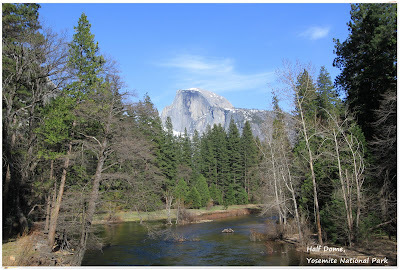 Some of our close friends advised us that we should visit Yosemite during the Spring so that we can see the magnificent scenery and waterfalls. The waterfalls are derived from the melted snow at the top of the mountains and they will be dried when they reach the Summer. 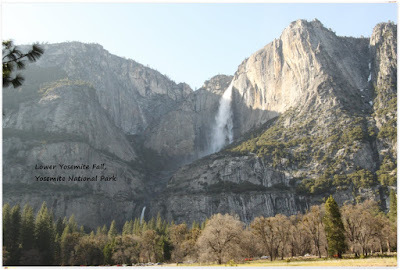 We were driving along the steep entrance of Yosemite National Park before reaching the first point which was Bridalveil Falls. 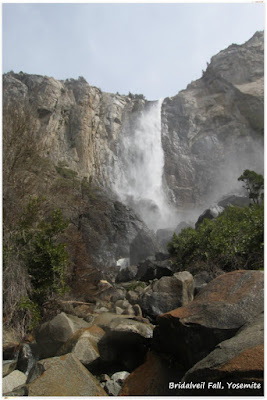 It took us at least a half an hour to reach Bridalveil Falls. Even though I was standing farther from the waterfall, I had the difficulty to take this shot when my camera lense was wet. I had to keep wiping the camera lense while taking these shots several times. When I left the scene, I realised my whole body and camera body were totally soaked due to the strong current of the splashing water mist from the steep hill. 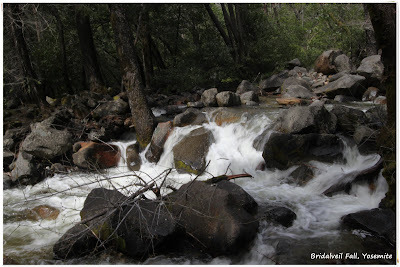 At last, I managed to capture this beautiful shot of Bridalveil stream through trial and error with my camera. This picture shot looked like the actual painting. After that, we went to Mariposa Grove. 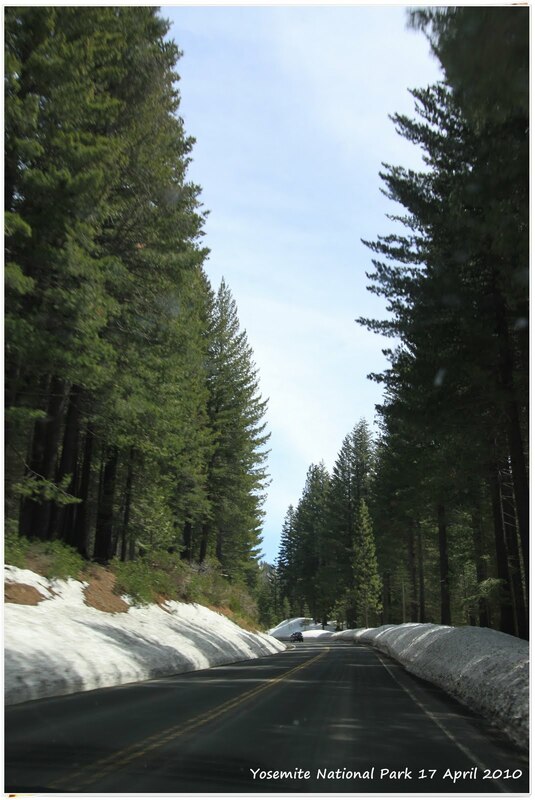 Vehicles were not allowed to be driven into Mariposa Grove as it was covered with packs of snow. Therefore, we parked our car near the entrance of Mariposa Grove and walked at least 2miles (3.2km) for about 2 hours before reaching Mariposa Grove. Mariposa Grove is the main attraction area at Yosemite National Park. You can find many Giant Sequoias here. 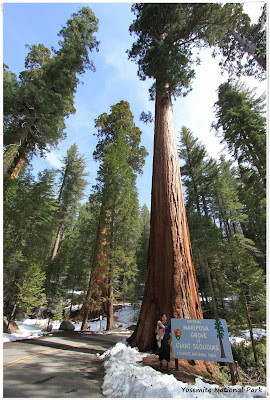 A Giant Sequoia can grow up to 368 feet (112 meters). Let's compare the heights between this Giant Sequoia and William's. Based on his height, his head was touching the root of this giant tree only. 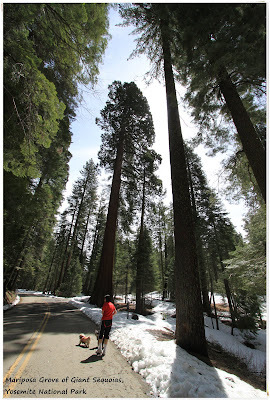 These Giant Sequoias surrounded us as we were walking along the paved road of Mariposa Grove. Then, we just took an hour in order to return to our car. It became easier since we didn't use much energy when we walked down the steep road of Mariposa Grove. We drove to the next stop at Mirror Lake. 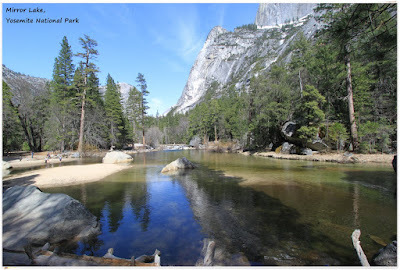 We had to walk for 1.8miles (2.9km) from the parking lot to Mirror Lake. It was sunny and windy but we didn't feel tired at all. Baby and Max looked tired but they enjoyed walking and exploring the smell of the bushes. Baby didn't crave William to carry her throughout our journey. She enjoyed everything as much as we did. Mirror Lake is famous for its reflection. If we were able to get the shot at perfect timing, then we were able to see the reflection of the trees and mountain clearly. By the time we went to the parking lot, it was almost 5pm. We had to get out from Yosemite National Park before dark. The road is narrow and steep and thus, it is dangerous to drive at night for those drivers who are unfamiliar with the road condition. On the way out from Yosemite National Park, we stopped our car in order to take nice pictures of Half Dome and Lower Yosemite Fall. As we were about getting into the tunnel of Yosemite National Park, we saw a lot of vehicles parked along the road. Many of the tourists were taking pictures of this scenery. We also stopped and took this opportunity to take a family picture with our dogs.